Collectively, Christmas-, Thanksgiving- and Easter Cacti are often called "Holiday Cacti." The first two are members of the genus Schlumbergera while the Easter Cacti comprise two species of the genus Rhipsalidopsis. Both genera are native to the tropical jungles of the Americas and, with other jungle natives of the family Cactaceae, are also popularly called "Jungle Cacti." This note is based on several articles that I wrote in the 1980s. The true "Christmas Cactus" is Schlumbergera x buckleyi, a hybrid between S. russelliana and S. truncata produced in the late 1840s by William Buckley at the Rollisson Nurseries in England. There are possibly two, perhaps three slightly different surviving clones (vegetative descendants e.g.by layering or cuttings) of three hybrids of this cross, named S.x.buckleyi 'Buckleyi ' , S.x.buckleyi 'Rollissonii', and possibly S.x.buckley 'Snowii'. 'Rollissonii', has flowers magenta in colour, 'Buckleyi', with white tube shading to magenta petals, and 'Snowii', with smaller magenta flowers and stem segments. Characteristically, the true Christmas Cactus has branches which are decidedly arcing and pendent and the stem segments (phylloclades) do not have the little points along the sides. The flowers are completely pendent and radially symmetrical (actinomorphic), with no distinct bend between the tube and the ovary. This plant is very popular, long-living and widespread but it is not so often seen in stores because blooms come a little late for good Christmas sales. Traditionally, however, it is obtained from relatives or from friends. Very large, very old heirloom plants carrying several hundred blooms are common. I once had a 1.3m(4ft) diameter, perhaps 30-year-old plant which often produced about 800 blooms between November and May. The name Schlumbergera bridgesii, still seen occasionally, was mistakenly published for it very early, and only in 1964 was the plant's proper history and correct designation traced and reestablished by Will Tjaden, a member of the Epiphytic Plant Study Group in England. Technically, all such plants (ramets) are collectively (a clone) descended vegetatively from and genetically identical to one plant (the ortet). In the case of the true Christmas Cactus, the ortet was one of Wm Buckley's hybrid S. russelliana x S. truncata plants in the 1840s. The plants most often sold in Canada as "Christmas Cacti" (by which name they sell best) are Schlumbergera truncata cultivars. These are clones selected for their colours and growth habit and given cultivar names. They bloom about a full month or more before the true Christmas cactus, given the same treatment, and so are more easily made to bloom at the best time for Christmas sales but flowers might not last until Christmas. They are also known by many popular names such as "Link Cactus", "Grandmother's Cactus", etc. Their flowers are asymmetrical (zygomorphic), not normally pendent, but bent somewhat upward at the ovary, so that they grow outward, rather horizontally from the tips of the segments on branches which are usually much more erect than those of the true Christmas Cactus. As well, plants with desirable different flower colours or other characteristics have been selected and/or induced by chemical and biological manipulation. These range from almost pure white (from the natural variety Schlumbergera truncata v. delicata) to a deep reddish violet. In 1982, a marvellous, strong-growing and very first yellow-flowered type, called 'Gold Charm', with large segments, heavy branching habit, and many flowers was introduced. Another, called 'Sonja', is a beautiful light mauve hybrid resulting from a cross between the hybrid S.x buckleyi and a cultivar of S. truncata. 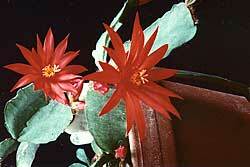 The Easter Cactus is Rhipsalidopsis gaertneri . 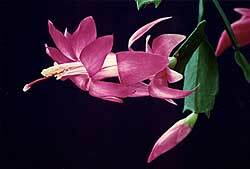 In some respects it is superficially similar to Schlumbergera. However, it blooms only once each year, in April (about Easter) and its flower is very different. It is not nearly as popular as the Schlumbergeras because it is rather more difficult to grow well, and it has the disconcerting habit of shedding its phylloclades (stem segments) at the slightest draught, or whenever over- or under-watered. It may refuse to bloom for no apparent reason. Enthusiasts tend to lose patience with this one, which is a pity, because it is quite magnificent in spite of all that. I treat these in the same way as I do Schlumbergeras, except that I am much more careful about watering and draughts, and I usually am rewarded with splendid blooms at the right time. R.gaertneri is the species, with scarlet flowers. 'Crimson Giant' and 'Rainbow' are some of the cultivars. All are beautiful when in bloom. Rose Easter Cactus is R. rosea, not at all likely to be confused with Schlumbergera. 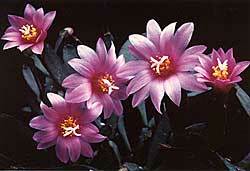 The flowers are pink, and small, and the plant can be described as a "miniaturized" Easter Cactus. It is quite magnificent, but even more temperamental about dropping all its stem segments. To compensate, however, all of these shed components will take root easily. Just leave them on top of the soil. 'China Doll' and 'China Rose' are some of its cultivars, both quite splendid. (Rhipalidopsis 'China Rose') One winter (1987/88), I kept all of my Rose Easter Cacti quite a lot cooler than usual - between 7oC and 13oC (44oF to 56oF) - and I noticed, the next March, that all were just loaded with buds. Later trials of such cold treatment seemed to confirm its value as a "bud trigger", and I still get superior results from using it with all of my other plants as well, during their dormancy periods. Unlike cacti of the arid regions, jungle cacti require significantly different treatment with regard to light, temperature, moisture, phototropism (response according to day/night ratio) and season of blooming and they also behave differently under various combinations of those factors. Nevertheless, they are all true cacti, all of them bearing the same 7 basic characters of Cactaceae the cactus family. I have found, over the years, that the very best treatment for the health of the plants, and especially for plentiful, correctly-timed flowers, is to place the plants outside in dappled or light shade, from after the last frost in Spring, to before the first frost in the Fall. Here in the Halifax area, my holiday cacti go outside about June 10, and are brought in about September 15. Direct sunlight must never reach them, except in Winter, although an hour or so at dawn or dusk is harmless and may even be beneficial. I place my 30-odd plants around the base of a large maple, and the larger plants on the north side of tall shrubbery, where they can get skylight from the northwest to northeast. The plants are stood on a deep layer of stones or suspended off the ground from simple tripods to prevent bugs and worms from entering the pots. From a couple of weeks after they go outside their appearance and vigour improves marvellously. This outside treatment eliminates completely the problems of bud drop and day length which are so troublesome with commercial and housebound plants. Outside, the required 25 short days and long nights, and/or the temperature lower than about 15oC(59oF), which trigger the blooming sequence, are achieved normally, and the shoots which will bud are ripened properly. Once those requirements are met, and presuming good cultural practices, the buds will not drop, as I prove each year, by moving my plants directly into the house or the greenhouse while S. truncata cultivars are in full bud. S.x.buckleyi plants, at this time, will not be in bud for another month, but they also have been properly conditioned, and they behave very well indeed. I hold some of my plants back a little by placing them under a bench in the greenhouse where it is increasingly cool at night. However, it is important to remember that the whites and the yellow become excessively pink if the temperature, after buds develop, is allowed to drop below about 21C(70F). Excessive light also has the same effect on the white varieties. Although irrigation should always be thorough, it is not a good idea to water until the soil has become just moist. The roots of these jungle cacti must be properly aerated or they will rot, so it is essential to use an open soil of about two or three parts coarse organic materials, incorporating some loam to provide trace elements, and one part coarse minerals like aquarium gravel and/or perlite. This means that we can allow the top centimetre of soil to dry out , to combat growth of mosses and sciara fly maggots, while the lower levels remain moist but open for air to penetrate to the roots. Epiphytes such as Schlumbergeras need acidic soil with pH at about 5.5 to 6.2 or so. Hence, if alkaline tap water is used to irrigate these plants, it is wise to acidify it with about a teaspoonful of vinegar to a gallon (about 1mL/Litre). A drop or two of nitric acid (per gallon) is better, but most people don't like to keep that stuff around the house. Acid rain is effective, but not dependable. 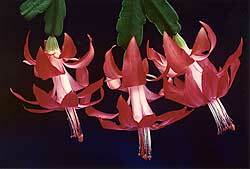 Many very successful growers dispose of their stale tea in the Christmas Cactus soil, and they swear by it. No doubt the tannic acid does the job. But nothing beats an occasional test with an acidity meter, or a litmus paper checkup, and pH adjustment as required with nitric acid. Soilless composts are almost always used by nurseries to grow these plants, and these usually lack the essential trace elements unless a complete fertilizer is used occasionally. Some growers of epiphytes recommend soluble fertilizer formulations such as "RX15" (15-30-15) once or twice a year. RX15 is well supplied with trace elements. I've been getting good results from 15-30-15 at 1 to 1.5mL/L (1 to 1.5 tsp/gallon =1/3 to 1/2 the recommended strength) once after each of the two short dormancy periods following the two main flushes of bloom in Oct/Dec and Mar/May. For the rest of the growing periods, May to September, I choose a "Phostrogen" (9-9-26 formulation) at about 5mL/20L (1 tsp/5 Gal) to use at every second watering or so. The high proportion of potassium (26) has been responsible for deepening the colours of the flowers and for inducing a greater number of branches to bloom as well as more twin and triplet blooms per branch. Unless plants are young and outgrow their pots, annual repotting is not necessary. It is usually best to repot every two or three years. But if the soil quality as to drainage, acidity and aeration is correct, even longer repotting intervals might be allowed. Many magnificent plants that I know have not been repotted for many years and, like many other plants, these bloom best when somewhat root-bound. Of course, much depends upon the type of soil and the pot. My largest one which I had had for about 18 years without repotting, had produced hundreds of blooms regularly between November and May each year. But it was not doing well by 1986. When I unpotted, the old soil seemed still to be in excellent condition, but I changed it anyway. The shock reduced the 1986/87 amount of bloom very drastically, and the plant didn't seem to improve either, until I put it outside in June 87. Then it brightened up and started growing new shoots extremely well. At that point I realized that its trouble was really too much shade in its northeast window in Winter. In later years it was shifted to a somewhat brighter west window where it got some late afternoon direct Winter sunlight from about November to March. Pests, Diseases, Prevention and Cure. Schlumbergeras are not much bothered by bugs, although Mealy Bugs and Root Mealy Bugs might appear if one gets a little careless. For Mealy Bugs, the classic solution is to touch each one with an artist's brush dipped in alcohol. Heavier infestation can be treated with a strong water spray followed by a heavy spray of Safer's Insecticidal Soap, repeated at about weekly intervals. If this doesn't work, a Malathion spray should do the trick. Diazinon should not be used, because it may cause dwarfing and distortion. Prevention is easy, however; regular misting with plain water and/or Safer's soap is very effective. For Root Mealy Bugs, if infestation is severe, unpot and wash all the soil off the roots, especially from all crevices, and dip the root system in slightly warm Safer's soap solution. On repotting, I have occasionally mixed granular Diazinon in the soil which actually touches the roots, and found it effective, but repeated use of any form of Diazinon should be avoided. Again, prevention is very easy. Root mealy bugs do not thrive in moist conditions, so correct watering habits are the most effective. If a few bugs survive, they won't do much harm. Further Information For those who are very interested in epiphytes, such as Schlumbergeras, Epiphyllums, Rhipsalis and others, membership in the Epiphytic Plant Study Group (http://www.epiphytes.co.uk/) in England is highly recommended. This group is very active, very precise, and it publishes an excellent quarterly periodical of some 25 to 30 pages filled with first rate, up-to-date information.